You can also add your URL!! 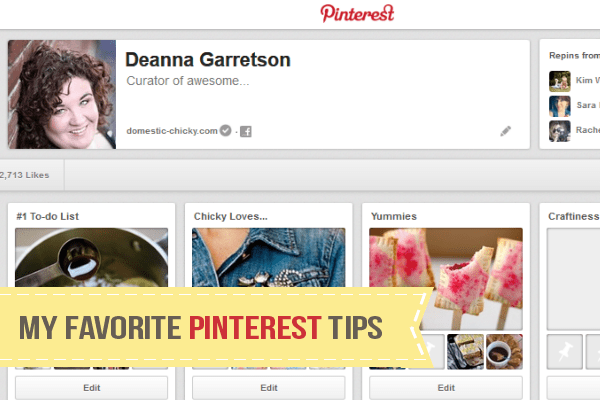 Link to your Pinterest account in your sidebar. You can also add a pin button to every image. Place a call to action at the bottom of both your posts and feed entries. List 2-3 of your most pinned images on your sidebar. use the description function when you upload images. Whatever you place in the description of your image becomes the text of the pin as it is pinned – be as descriptive as possible!! Use creative (but relevant!) titles. Use the private boards for…well, things you want to (or should!) keep private. No one minds when you pin one of your posts, but when you’re pinning 10 things in a row from your blog, it’s too much. Try to pin (or re-pin) 10 things for every pin from your own content. Check for valid links in your pins – if I can’t check out a link right away I will “like” it instead. PS – don’t forget to follow me on Pinterest!! I love pinterest! Great tips! Also use Pinalerts to track what's pinned from your site and get daily reports!! Thank you!!! Will check out Pinalert!